You have accidentally deleted files from a USB pen drive or photos from an SD card. Since there is no recycle bin there, there is simply no way to restore this data. There is no guarantee for data restoration but it is also not impossible that you can recover deleted files. What is of utmost importance is that after the deletion, you should not write anything on the disk in question because that could cause the required content to be overwritten. 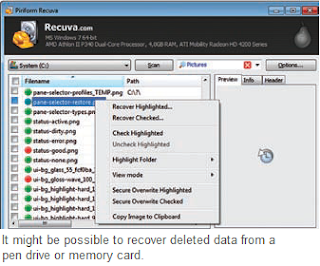 In order to prevent this, install the free tool Recuva on your hard disk. It is available from www.piriform.com/recuva. After a quick installation, a wizard comes up that helps you with the following steps. First select the file type such as ‘Images’ or ‘Documents’ or use the ‘Other’ option for a complete search. Click ‘Next’ and then select the relevant memory location. Then search for a drive or partition, select the option ‘At a specific location’ and then enter the memory location or navigate there via ‘Browse’. You can also select ‘Recycle Bin’ or can search the entire computer with ‘I am not sure’. Then click ‘Next’. In the following dialog box, keep the option ‘Activate deep scan’ deactivated since this analysis can take very long. You quickly get a result after clicking ‘Start’. The list shows all the deleted data and highlights files that can be restored. By clicking the ‘Advanced Settings’ button, you can select every rediscovered file, see a preview of it to the right and view detailed status information in the ‘Info’ tab. In case of files marked in red that cannot be restored, you can immediately see what they have been overwritten with. When restoring, activate the checkbox for the required files and then click ‘Restore’. Always select a folder on another drive as the storage location and then click ‘OK’. Note: The restoration usually works for defective or garbled files as well, but of course the result will also be garbled. In case of a text file however, this can still be of a little help if certain parts of the text become legible once again.